This is a modern constellation created by the Polish astronomer Johannes Hevelius during the seventeenth century and published in his Firmamentum Sobiescianum. Mon Maenalus depicts a mountain on which the constellation figure of Bootes, the herdsmen or bear-driver, is stepping upon. 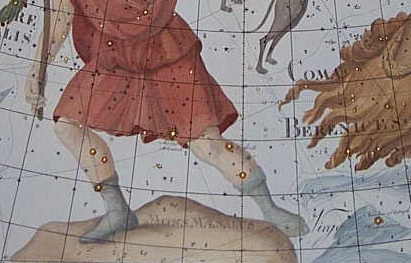 The constellation was added by several other astronomers in their star atlases, but it never became official, and is disregarded by astronomers. Currently there is only one mountain constellation accepted by astronomers, Mensa, the table mountain, which is faint constellation seen by observers in the Southern Hemisphere.